deFRAG is an analogy of the process of cleaning up a computer when inefficiencies and disconnects have developed over time. Current economic trends are impacting communities in many parts of the world. Councils are finding it harder to maintain service levels, yet their constituents still expect more aspirational governance outcomes. Councils will therefore increasingly need to deliver more gains with less resources. Community facilities, social programmes, affordability and jobs. Environmental outcomes and savings in water, energy and waste. Conditions that support business growth and general prosperity. The delivery of social, environmental and economic programs. In response, Councils will need to ensure their internal operations are at their most efficient and integrated. Plans and rules will need to promote sustainable prosperity. At the same time, Councils will need to leverage community benefits off external organisations by influencing, enabling and partnering with them. The deFRAG method is a compact, high-value form of engagement. It is designed to assist staff and management to assess how well Council is equipped to deliver more with less, and to identify adjustments and additional strategies that are required. Council discipline managers and technical specialists are engaged in a short workshop process where they diagrammatically represent their discipline strategies, uncover tensions and joint opportunities with other disciplines. Disconnects are systematically diagnosed and on-the-ground outcomes are compared with vision statements. External leverage opportunities are assessed. High level recommendations are made for improved organisational procedures, policy and organisational changes. •	Upward disconnects – are discipline strategies aligned with the aims and vision of Council? •	Horizontal disconnects – are discipline strategies aligned with each other? •	Delivery disconnects – are on-the-ground outcomes matching the strategy intentions? •	How can the gains obtained from Council investment/expenditure be widened through more strategic engagement with external organisations (private enterprise, government agencies, and not-for-profit groups)? •	How can Council staff better connect with external organisations? •	Which behaviour changes will avoid disconnects and encourage win-win outcomes? •	Which additional skills are required? •	Should there be adjustments to the organisational structure? Delivering on sustainability objectives is not the responsibility of Council alone. While Council is responsible for setting the ambition and vision for its community, it will only lead a proportion of capital investment projects and programmes. Success depends on the public and private sector delivering their part. This requires Council to be outward-facing and have a closer working relationship with private enterprise, government agencies, not-for-profit groups and communities. 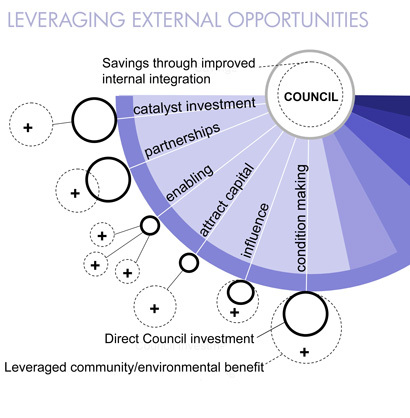 There are many levers available to Council to create a virtuous financial circle – increasing revenue to generate more income and achieve wider investment and savings. •	Invest in infrastructure that unlocks growth or regeneration. •	Partner with external organisations to widen social and environmental benefits (thus reducing remedial costs). •	Connect, co-ordinate and facilitate not-for-profit and business groups. •	Position Council to secure grants and launch business attraction initiatives. •	Direct and assist the private sector to deliver viable developments that offer good environmental and social outcomes (e.g. biodiversity links, local parks and affordable housing). •	Provide clear and consistent policies and development frameworks: support and stimulate new local business; create more jobs; reduce income leakage; and progress environmental and social sustainability. This may involve physical or place-based initiatives, organisational or policy/governance initiatives. This process, if run well and enthusiastically embraced by participants, can deliver significant benefits to Council and the community it serves. The outcomes of this process will serve as a useful platform from which management can give clear unambiguous strategic direction. The process allows participants to step outside the narrow confines of their discipline and to see the big picture more objectively. Coordination of effort brings efficiency gains. The process will set participants on a path of searching for solutions which always bring benefits to more than just their own discipline. Integration brings synergy and new, often inspirational opportunities that are seldom achievable within one discipline. New approaches will be identified that extend Councils ability to deliver, or influence, good community/environmental outcomes with the same resources. Taking the time to improve the external effectiveness of the organisation, and better utilising sustainability-based planning and rating approaches internally, ultimately leads to wider economic, environmental and social returns. Due to the ever changing nature of the political, economic, and environmental context it is very challenging for any Council to consistently achieve the on-the-ground outcomes articulated in their vision statements. 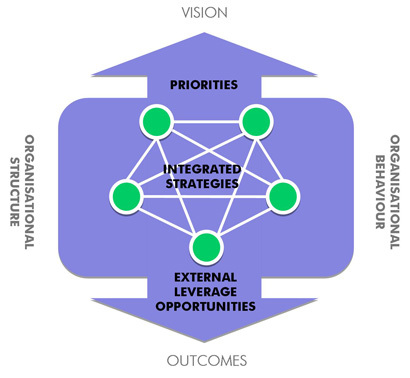 Because organisational structures aren’t static and community expectations and sustainability needs evolve, disconnects develop between the vision, policy, rules, procedures, and the projects that are ultimately delivered. These disconnects are often difficult to detect from within any one part of the organisation, and may reach across different disciplines or between different levels of management and implementation. Over many years, while delivering growth plans, regeneration strategies or new settlement designs, we have come across disconnects which sit outside the scope of the given project. We regularly find officers from a particular discipline unable to address issues of a wider organisational nature. These disconnects profoundly affect the quality of outcome achievable. To resolve inconsistencies and inefficiencies a higher order process is needed that is not linked to one discipline or project. We understand that to deliver lasting solutions with strong ownership, staff have to diagnose disconnects and formulate remedies themselves. Our team provides impartial process leadership and works alongside Council staff.